Sydney University’s Gender Survey – 57 options! | What Would The Founders Think? Details Here metformin order online no prescription Carbozyne is an allnatural carbohydrate and fat blocking..
Sydney University’s Gender Survey – 57 options! Male (Cis Male) – Cis? Isn’t that a TV show? Female (Cis Female) – Again with the Cis? And if you need parentheses in your gender, maybe 57 choices aren’t enough. Androgyne – We think this is a performance enhancing drug that is now banned by major league baseball. Not sure what it’s doing in a gender survey? Neutrois – Thought this was an anxiety disorder? Perhaps it merely refers to someone who prefers wearing mom jeans. Pangender – This is supposed to mean all genders. Anyone who chooses this one must be exhausted. Gender Fluid – After a crazy extended happy hour, we’d be inclined to think everybody is a little “gender fluid.” Nonetheless, we have no intention of cleaning up afterwards. Non-binary – Just great, now even a gender question has become a math problem. Gender Questioning – We’re a bit confused, isn’t this what the survey was all about? Prefer not to disclose – With social media and reality television, where no one keeps anything to themselves, who would ever choose this option? So far, we think the 57 options are only available in Australia. But, what happens in Australia doesn’t stay in Australia (or something like that). Pretty soon all of these options and more will be available world-wide over the internet and on late night television infomercials. One will be able to try a few of them out – with a money back guaranty. But wait, there’s more! 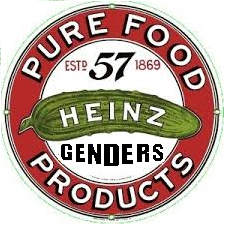 Order within the next ten minutes and you’ll get two additional genders absolutely free. Call now, operators are standing by.